The self-anchoring V-LocTM wound closure device is intended to be the next step in intracorporeal suturing during minimally invasive endoscopic surgeries. A knotless barbed wound closure device has been developed that enables safe and effective suturing during minimally invasive surgery without the need for intracorporeal knot tying. The objective of this study was to demonstrate the efficacy and efficiency of using an absorbable barbed wound closure device against an absorbable non-barbed suture for gastrointestinal enterotomy closure. The V-LocTM 90 absorbable wound closure device (Covidien, Mansfield, MA) is a unidirectional barbed monofilament suture designed to obviate the need for knots at the initiation and termination of a simple continuous pattern. The barbed wound closure device is constructed from Biosyn™ suture with the presence of self-anchoring, protruding unidirectional barbs in various positions and geometries along a monofilament strand of suture and a preconstructed end loop (Figure 1). The Biosyn™ suture (Covidien, Mansfield, MA) is a synthetic absorbable monofilament suture made from a synthetic polyester composed of glycolide (60%), dioxanone (14%), and trimethylene carbonate (26%). Both test articles have the same absorption profile with the polymer retaining 75%, and 40% of its tensile strength at two and three weeks, respectively. Fourteen canine subjects (n=14) had 25 mm enterotomies created in the anterior stomach (2), jejunum (4) and colon (4) through midline laparotomy. 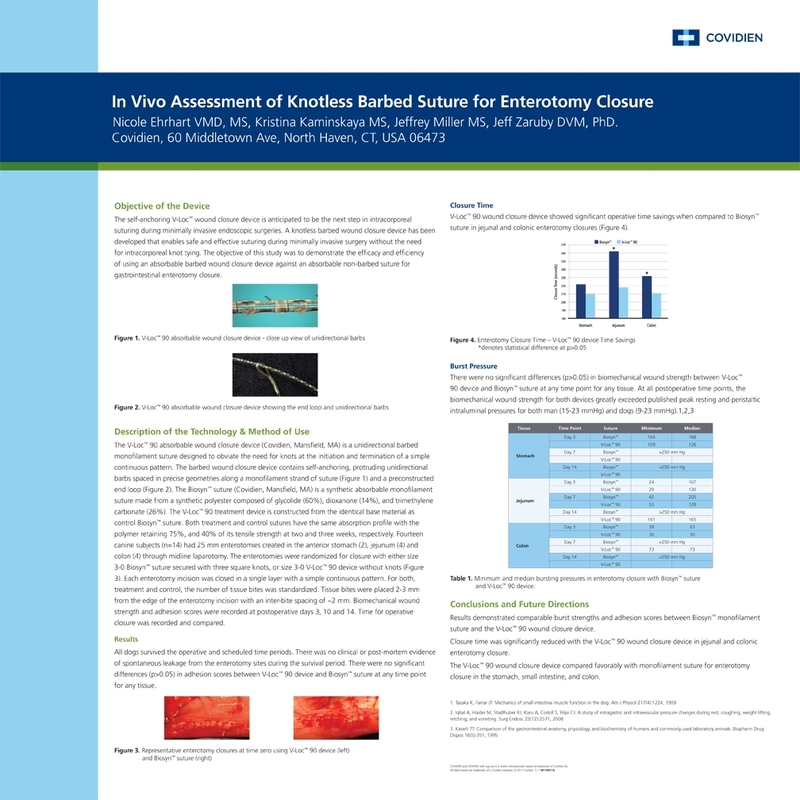 The enterotomies were randomized for closure with either size 3-0 BiosynTM suture secured with three square knots, or size 3-0 V-LocTM 90 device without knots. Each enterotomy incision was closed in a single layer with a simple continuous pattern. Biomechanical wound strength and adhesion scores were recorded at postoperative days 3, 10 and 14. Time for operative closure was recorded and compared. V-LocTM 90 wound closure device showed significant operative time savings when compared to BiosynTM suture in jejunal and colonic enterotomy closures. There were no significant differences in biomechanical wound strength and adhesion scores between V-LocTM 90 device and BiosynTM suture at any time point for any tissue. At all postoperative time points, biomechanical wound strength for both devices greatly exceeded published peak resting and peristaltic intraluminal pressures for stomach, jejunum, and colon. The V-LocTM 90 wound closure device results in comparable gastrointestinal closure to BiosynTM suture while being significantly faster. These results will serve as a basis for further V-LocTM studies to assess its use in minimally invasive endoscopic surgery.